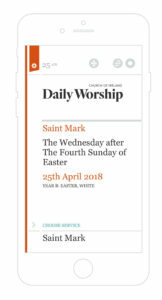 http://bit.ly/2KOaD5tThe Book of Common Prayer (BCP) was brought into the smartphone era with the launch of the Daily Worship app at this year’s General Synod. The app is an initiative from the Church’s Central Communications Board in close co-operation with the Church’s Liturgical Advisory Committee. Daily Worship presents Bible readings, prayers, canticles and Services from the BCP in one place and in a simplified format. These are available for each day of the year, covering five Services: Morning and Evening Daily Prayer, A Late Evening Office, Compline, and Holy Communion. This app aims to help us in our personal and communal prayer lives – bringing us closer together as a church family and to the God whom we worship. You can download Daily Worship from App Store (https://apple.co/2rv5aYM) and Google Play (http://bit.ly/2KOaD5t) for use on Apple iOS and Android devices – it costs just €1.09/99p.